Shikoku, Japan’s island of natural beauty and spirituality was once remote, and divided into four regions—hence the name shi (four) koku (regions). Today, it is easily accessible from Honshu and draws people with its gorgeous natural bounties like the Iya Valley, the Oboke Gorge, its beautiful coastline and imposing mountains. It also boasts numerous temples and is a famous pilgrimage destination. Takamatsu, the capital of Japan’s smallest prefecture, Kagawa, is a beautiful port city in Shikoku. 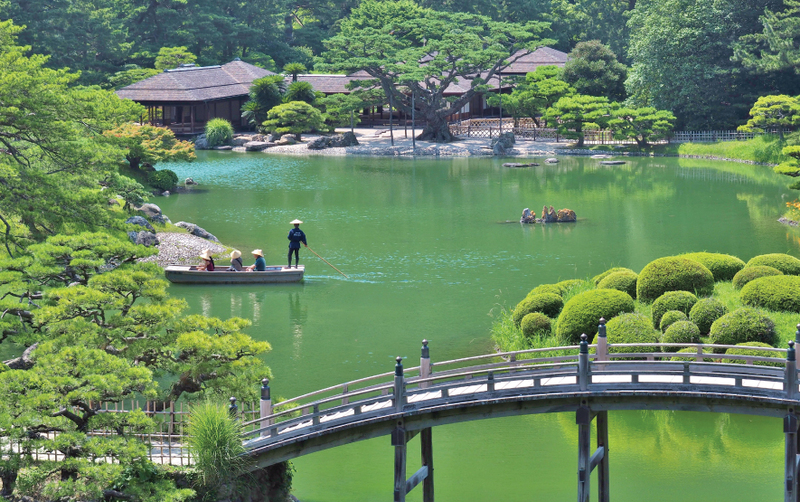 It is known best for its Ritsurin Koen, a traditional treasure in Japanese gardens. Painstakingly created over the span of a century, it was originally designed as a walking garden for the daimyo, and boasts winding pathways, glassy ponds, beautiful bridges, scattered tearooms and islands. Mt. Shiun in the background enhances the beauty of the garden. 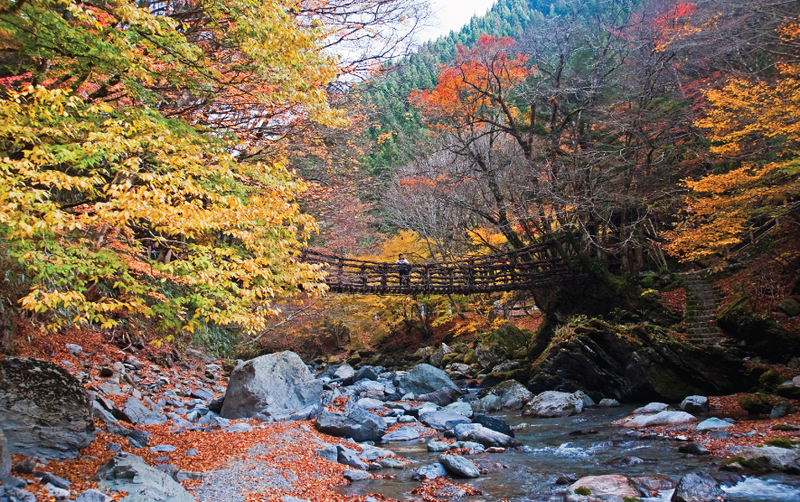 From the lovely city on to splendid nature beyond, visit the Iya Valley, a stunning yet remote valley in western Tokushima Prefecture. 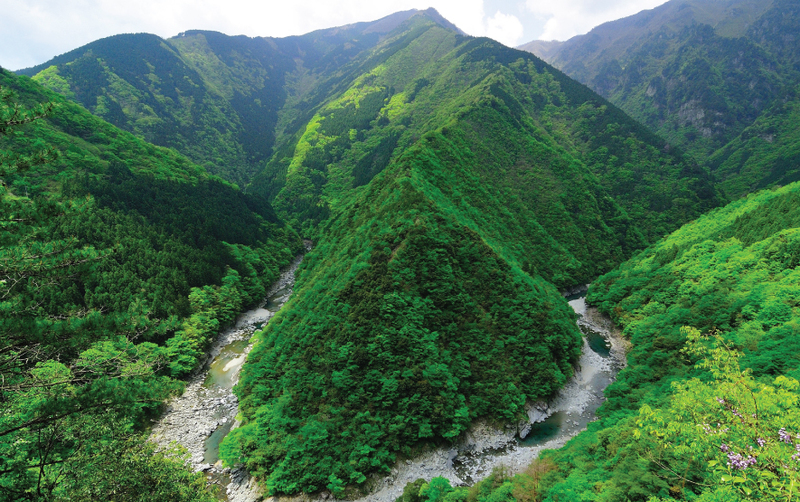 The atmosphere of ancient times pervades Japan’s “hidden” valley, with its misty gorges, steep mountainsides and crystal-clear rivers. You’ll have to cross the deep gorges on vine bridges, which are a major attraction in this area. The bridges, created using Wisteria vines, are steeped in folklore. The largest is the Iya Kazurabashi Bridge which spans the 150 ft. distance across the valley at a height of 50 ft. above the river. Discover two other beautiful bridges on the western side. Lying side by side, they are called the husband and wife bridges. If you have a taste for adventure, then get the adrenaline flowing by crossing these vine bridges! Iya is also popular for its hot springs and the various outdoor activities it offers. Nana Magari is considered the most dangerous area in the Iya Valley. Here, you’ll find a statue of a little boy peeing, perched on the overhanging rock to ward off daredevils who try the same stunt off this ledge. At a height of 200m from the valley floor, it can make anyone dizzy just looking into the dense greenery way down below. 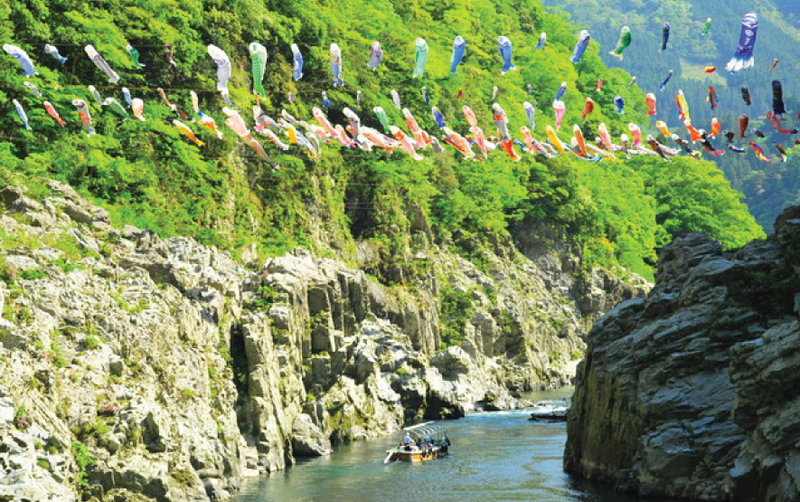 Also in western Tokushima, flows the Yoshino-gawa River, where upstream lie the Oboke and Koboke gorges. Both are best enjoyed on a sightseeing boat that will take you from Oboke to Koboke through tranquil areas leading to an area of rapids. As you meander through the deep ravines, you’ll have time to admire the fascinating beauty of the surrounding foliage which comes alive with cherry blossoms in the springtime. The Oboke gorge has some especially interesting rocks and schist formations, because of which is has been designated a national monument. Shikoku is a diamond in the raw, and not many people have ventured to discover its stunning and precious heart. 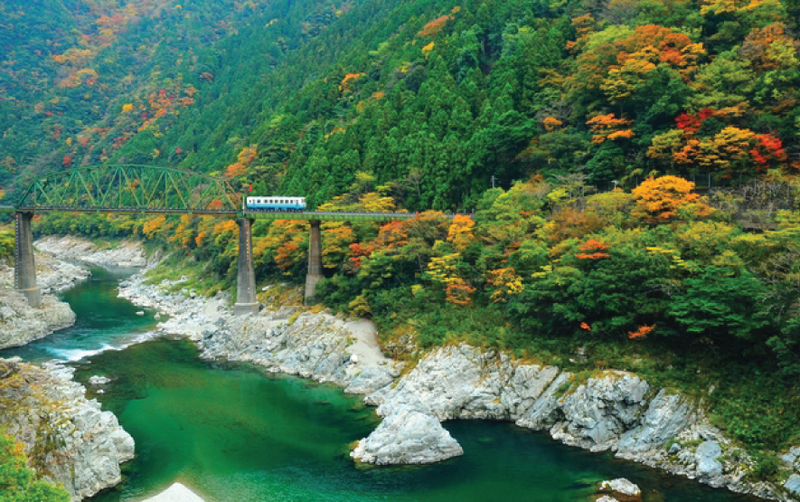 If you’re game for adventure or would love to be soaked in the dazzling beauty of nature, then Shikoku is where you should go, for the most memorable time ever. If you are planning a trip to Eastern Shikoku in Japan, do not hesitate to contact your luxury travel designer Mr. Isao Numano.